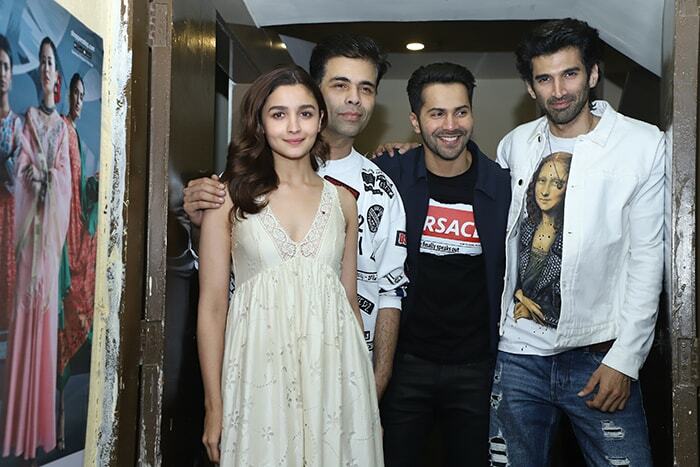 Team Kalank hosted a special screening of the film at a Juhu PVR on Sunday and in attendance were Alia Bhatt, Varun Dhawan, Aditya Roy Kapur, Sonakshi Sinha and also Karan Johar. Here's team Kalank posing in full tashan. Kalank releases on April 17. For Alia Bhatt, denim jacket is bae - no matter how glammed up your look for the night is. Alia, Varun, Karan and Aditya played hide-and-seek with the cameras. Varun Dhawan always has a joke up his sleeve. Varun Dhawan, Alia Bhatt and Aditya Roy Kapur play pivotal roles in Kalank. Madhuri Dixit, escorted by heavy security, set the flashbulbs popping. Sonakshi Sinha was pretty in a peach suit. Sonakshi, who plays the role of Satya in the movie, brought along her mother Poonam. Shweta Bachchan Nanda also checked in to the Kalank screening. Kunal Kemmu, who also stars in Kalank, was also spotted. It was so sweet of Hiroo Johar to have joined the screening of her son Karan Johar's new film. Veteran choreographer Saroj Khan, who is the face behind the stellar dance moves in Kalank, greeted everyone with folded hands. Designer Manish Malhotra, who designed costumes for Kalank, was also spotted at the early screening.